When she was diagnosed with autoimmune arthritis, author Barbara Searles wished for a mentor to guide her through the dizzying maze of treatment options. She knew the chronic pain hurt, but she didn’t want it to win! And integrating nutritional, holistic methods into her treatment plan was imperative. Based on Barbara’s experience as a massage therapist, holistic health and pain relief coach, and woman in pain, Kick Pain in the Kitchen offers you a holistic approach to pain relief that can be integrated with many other treatment plans. It’s full of straightforward, every day steps that anyone can start using right away. 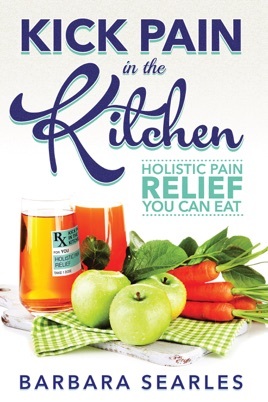 Kick Pain in the Kitchen is part informational, part inspirational, and part practical. You finish the book with plenty of options and a new focus on healthy habits to relieve your pain naturally. Barbara Searles' "Kick Pain in the Kitchen" serves up some innovative and effective insight and practical advice for those who suffer from chronic pain and inflammation. The book guides readers through a some simple strategies they can use to begin transforming their lives, and is based upon Barb's own professional and personal experiences as a Health Coach and Therapeutic Body Therapist. This is one of those books that everyone should read, because most of us know at least one person who suffers from chronic pain, and the insights Barb offers, could make such a difference in their lives. As a naturopathic physician, this is one of three books I recommend to my clients and patients as "essential reading".